Purchase - Amazon International, Amazon India, Available in paperback as well as e-book. ‘Travel across India’ is almost on everyone’s ‘To-do before I die list’ and this guide to go backpacking to Northeast India is just what one needs to carry around. 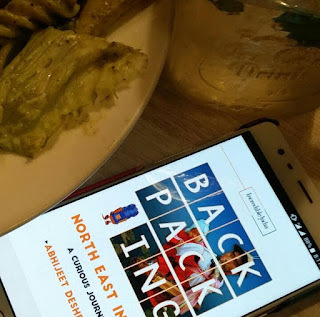 Abhijeet Deshpande along with his wife Navita embarks a journey which will make you jealous of pure and unfiltered travel experience, which is very skillfully penned down in Backpacking North East India. This curious journey will indeed keep you on toes as you are enthralled to see the cities, tourist must-visit places, and the lesser known spots as well. The book takes you hopping from one place to other showing you the culture, local people, and rituals. We get to take part in this expedition first hand while reading through their story. However, it is not just a story about travel; there are various other aspects to it. You get to go on an adventure, feel the fear, know the happiness, capture the enchanted scenes, and to let your imagination run wild. Abhijeet Deshpande is a traveller by choice and certainly good at creating a picturesque representation of his journey through his words. Minimalistic travels have been the author’s forte and he has been at it for over 20 years now. This book is written in a simple language making it easy to understand and would certainly be handy whilst planning your travel to North East India. The detailed outlines of each place of visit and the challenges faced throughout the journey make it easier for the reader to stay connected throughout the end. The personalized writing style distinguishes this book from others. So, when you are planning your next trip, you know just where to look for! Grab your copy now.